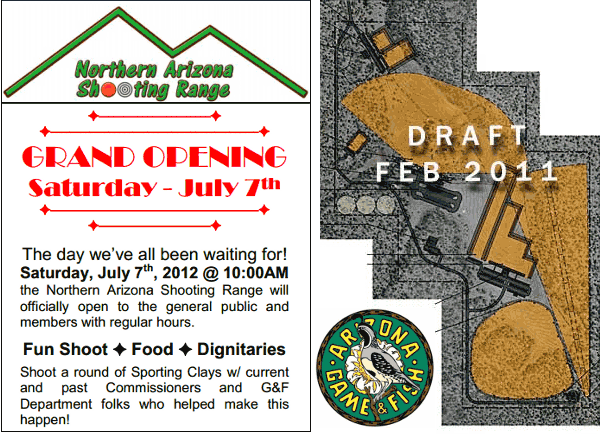 The all-new Northern Arizona Shooting Range (NASR) opens on Saturday, July 7, 2012. The public is invited to the grand opening of the 160-acre NASR facility, located east of Flagstaff, AZ. Following opening remarks by state officials and politicians, there will be a traditional Hopi blessing by representatives from the Hopi Tribe, and then the ceremonial ribbon cutting for the range. Following the ceremony, the public will have the opportunity to shoot .22 rifles on the 100-yard range and try out archery on the 50-yard range. Loaner .22 rifles, ammunition and archery gear will be available for this activity. Shotgun shooters can sign up for the National Sporting Clay Association registered sporting clays events or fun shoots. Registration for these events opens at 9 a.m. for the Saturday shoots, which begins at 11 a.m. On Sunday, shooting events begin at 10 a.m., and registration opens at 8 a.m. A food vendor will also be on site Saturday. The opening of the Northern Arizona Shooting Range is the culmination of a long-term effort by the Arizona Game and Fish Department (AZGFD) and shooting sports enthusiasts to establish a public shooting range in the Flagstaff vicinity. In July 2010, the 160-acre Foster Ranch in Coconino County was acquired as the site of the much-needed local public shooting range. Northern Arizona residents had been without a rifle and pistol shooting range since 1968. In 1994, closures of the local shotgun and archery ranges resulted in one of Arizona’s largest communities not having a designated place for recreational/competitive shooting. Under an agreement with the AZGFD, the Northern Arizona Shooting Foundation, a nonprofit 501(c)(3) organization, will operate the range. The Northern Arizona Shooting Range is located approximately seven miles southwest of Winona. Take I-40 east from Flagstaff about 10 miles to the Winona Exit (Exit 211). Head south on the Winona Ranch Road for about two miles to Forest Road 128. Take a right (west) on Forest Road 128 and follow it for about four miles. The range is on the left (east) side of the road at Forest Road 128A. Follow the signs. Share the post "Public Invited to July 7 Northern Arizona Shooting Range Opening"